Marble is a prized, natural material and has been used for more than 2,000 years by artists and builders. Its lustrous appearance, lasting quality and resistance to damage has made it a choice decorating material. Today, marble is one of the favorite natural stones for use as floor tiles, thresholds, window sills and countertops. Marble is available in a wide range of colors and shades, and the actual appearance is determined by the contaminants present when the rock was pressed and morphed. Stone thresholds are becoming more and more an integral part of the interior design of homes and commercial properties. Wherever a transition occurs between two different floor surfaces, a smooth saddle is often installed to make for easy passage. These thresholds also help protect against wear and tear along the edges of carpet and tile, and they prevent water seepage from the floor surface down into the substrate material. The advantages of installing marble thresholds are many, but there are also a few drawbacks. Both the pros and cons of using marble thresholds will be discussed here. Builders, installers and property developers are encouraged to note the uses of thresholds and decide whether this material is suitable for the job at hand. Natural stone is the preferred material for covering a floor transition. Wood looks nice when treated and stained, but it eventually decays. It also tends to pull away from the floor, allowing for the intrusion of moisture. Wood also scuffs very easily and therefore needs constant attention. Small chips, cracks, dents, or splinters cannot be fixed in a manner than is visually acceptable. In other words, wood thresholds are far from permanent. Marble thresholds provide a smooth transition surface between carpet and tile. This material is actually a bit porous, but the percolation is very slow and deliberate. So long as the moisture is wiped away, marble will not allow for the intrusion of water to the subfloor. Marble thresholds will not buckle. They are cemented or grouted directly onto the subfloor and once in place, they will not budge. Even after thousands of encounters with foot traffic, carts on wheels and sliding objects such as heavy containers being dragged across the surface, marble thresholds maintain their position as an efficient water barrier. Marble thresholds also add to the appeal of the indoor environment. These natural stone saddles are commonly used at the entryway to the bathroom. If the bedroom is carpeted and the bathroom is surfaced with marble tiles, a complementary shade of threshold is often used to create a secondary color accent. Marble increases a property’s value. Because it is a durable product, maintenance is kept to a minimum, and the replacement of marble is a very rare occurrence. Anything a property owner can do to reduce future overhead expenses is a plus. Standard thresholds have a 1/4-inch bevel along one side. This makes for easier passage of foot traffic. Hollywood bevels are often seen on wider thresholds and are commonly used in areas where heavy objects may pass between two different floor thresholds. This type of threshold is often used in handicap-accessible condo units or single family homes. Hotels often have Hollywood bevel thresholds installed to make it easier for those in wheelchairs to pass from one floor surface to another. Thresholds made of marble not only act as a water barrier, they prevent tripping by providing a smooth surface of polished stone. Most of the standard size and thickness transition saddles sit flat against the subfloor, with the top of the stone at the same level as the carpet or tile. This is in compliance with ADA requirements for safe foot traffic. The cost of the material varies depending on from where it was purchased. The installation of marble thresholds is rather simple and can be completed by a specialized flooring product contractor. The initial cost of the material is outweighed by its ease of installation and long life expectancy. Thresholds made of marble come in standard sizes. The usual length is three feet, about the same as most doorway openings. These thresholds can be cut smaller using a diamond blade saw, but the person performing this task should be an expert in the cutting down of natural stone. Single- or double-bevel thresholds can be used as a perimeter stone for flooring tile projects, but the color must match exactly. It is important to order the materials from a single distributor that purchases large quantities from a single quarry operation. Getting a color match can be difficult because every geological formation of marble is somewhat unique in its color and texture. Once in place, marble thresholds are rather difficult to uninstall. They are tightly bound to the subfloor and can easily crack or break if an attempt is made to separate them from the cement. Marble will also fade in color if moisture is not cleared away. It is important to recognize a marble threshold as a permanent fixture in the home or office building, meaning that careful consideration should be given to the texture and color shade chosen. Buying marble thresholds in small quantities is very expensive. Smaller retail outlets usually have to order the exact color shade chosen by the consumer. This drives up the per-piece price and makes it difficult to obtain a threshold that is precisely the color chosen by the end user. This is where the cost savings can be seen. 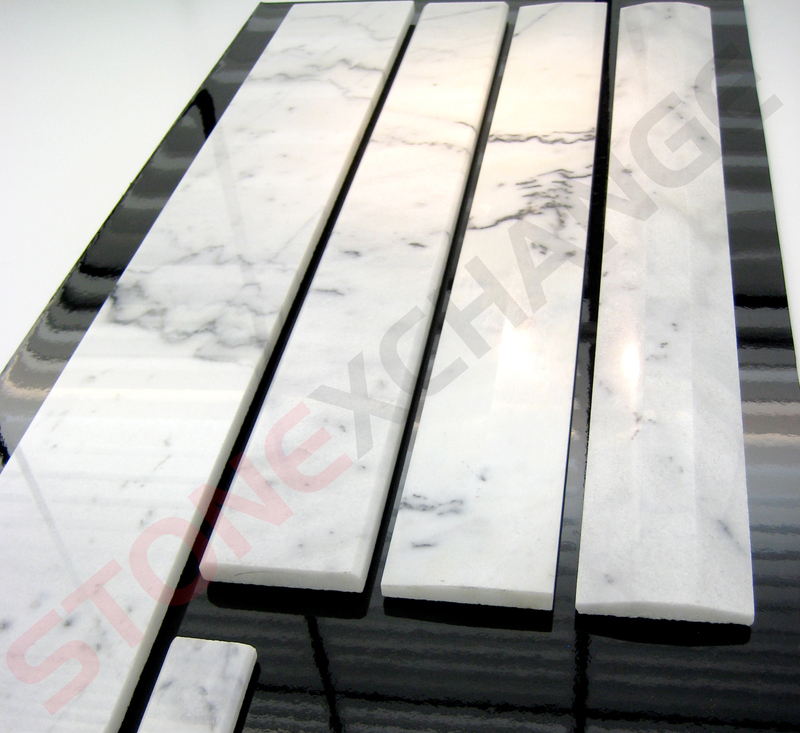 A wholesale importer of fine marble products works in partnership with overseas quarrying operations. These companies have a nearby cutting and fabrication facility that is staffed by some of the finest cutting technicians in the industry. Exact size, shape, and bevel angle are produced time and time again, with thousands of beautifully cut and polished thresholds being turned out each and every day. Stonexchange is located in Miami, Florida, and is one of the leading importers and distributors of fine marble products in the United States. Our company is able to procure large quantities of marble thresholds, flooring tiles, window sills, and mosaics directly from the manufacturing operations located in Turkey and the southern part of Europe. Transatlantic freight companies charge by the crate. If the crate container is half-full, the charge will be the same. Our company orders huge quantities of marble product on a constant basis, and because we have our product shipped in full containers, our freight charges and import tariffs are significantly reduced. The only way to make the buying of marble thresholds affordable is to pass along this savings through the sales of bulk material. We sell our beautiful marble thresholds in containers of 50-100 pieces depending on the style and size chosen by the client. We also process custom orders for our commercial customers who request thicker, wider, or more gently sloping thresholds. These orders take approximately 10 weeks to process, but we offer the same low price as for our standard size material. There would be no market for fine quality marble stone if the potential consumer base was very small. In truth, marble is affordable so long as it is ordered in bulk. Since our clients are construction companies, retail flooring product chains, and home improvement centers, we provide a necessary link in the process of getting these beautiful marble products to market. The end result of our efforts is a cost savings for the consumer as well. Think of marble as a worthwhile investment in any type of residential or commercial property. Our marble thresholds are top-quality, are quite affordable, and will go far in helping to beautify an interior environment. For complete details on how to order bulk quantities of marble thresholds, or if you would like information on how to become a dealer for our products, contact us today. We are a premier importer of natural stone products, and we look forward to providing you with the best marble thresholds available.